Ready for spring? Looking for a great dish for your Easter dinner? Search no longer! 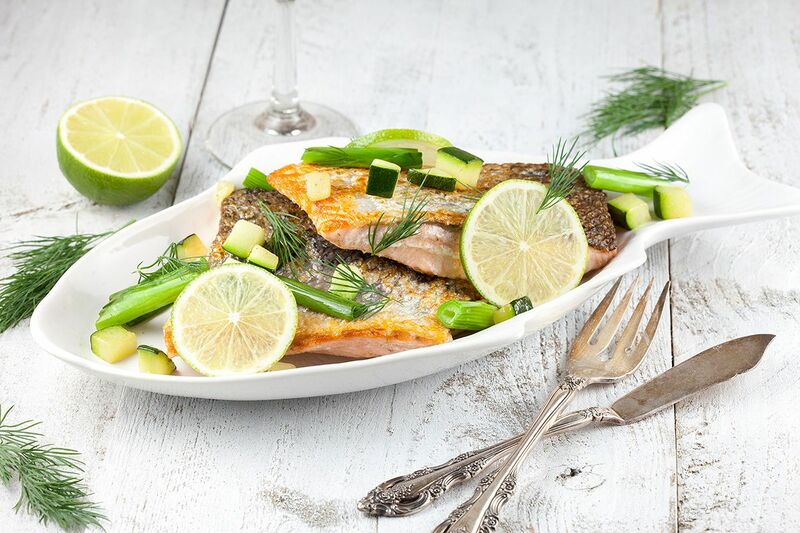 Skin baked salmon with scallions and lime is very refreshing and light. CHOP the zucchini in cubes, not too large. REMOVE the outer part of the scallions and cut off the root. RINSE the scallion, make sure there’s no sand stuck between the leaves. SLICE the scallions into large pieces. Cut half of the lime into slices and set aside. 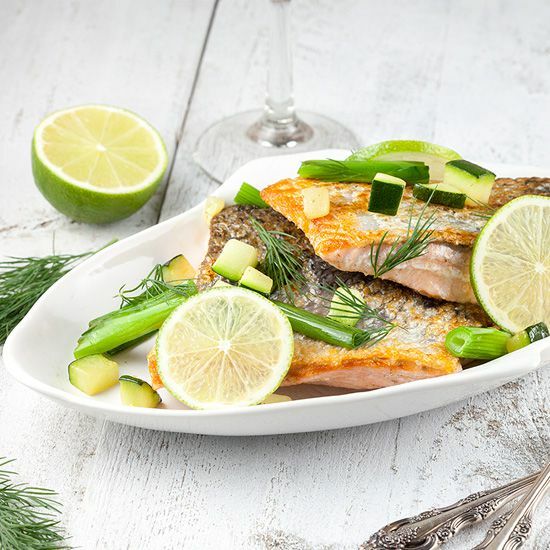 HEAT olive oil in a medium-sized skillet and pat the salmon filets dry with a paper towel. BAKE the salmon on the skin side for about 3 to 4 minutes, until the skin is golden brown and crispy. 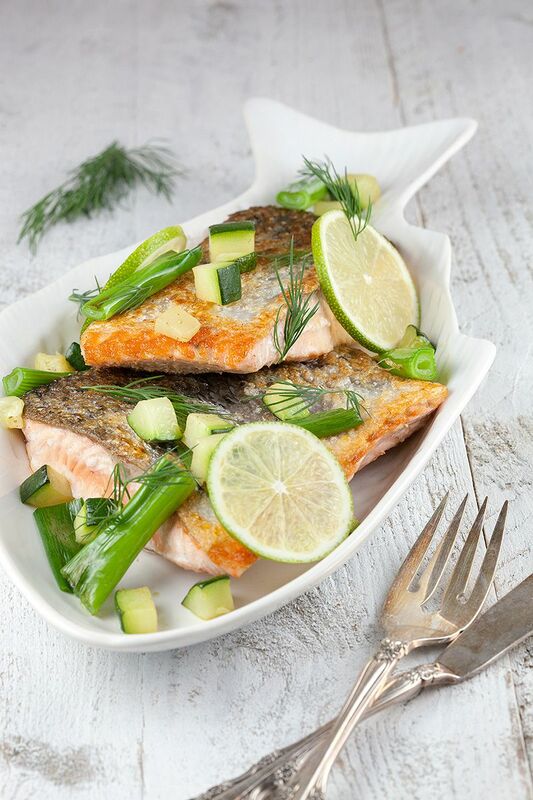 Simply place the salmon fillet in the skillet without moving or stirring it. This prevents the salmon fillet from falling apart while baking. Meanwhile HEAT olive oil in the second medium-sized skillet and cook the zucchini cubes for a few minutes on high heat. They should still have a bite to them. Season with pepper and salt. Flip the salmon filets and bake about 2 minutes more on the other side, squeeze juice of half a lime over the salmon and season with pepper and salt. REMOVE the zucchini from the skillet and add the chopped scallions. TOSS them around for 1 to 2 minutes. 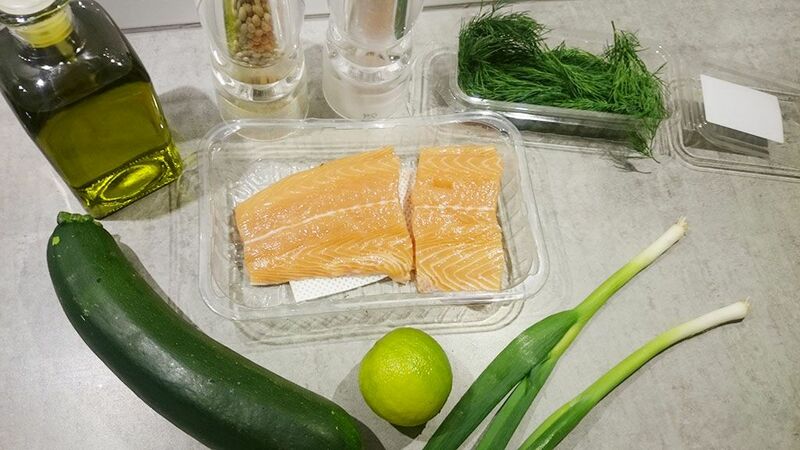 Place the baked salmon on a plate, divide some zucchini cubes and baked scallions over the salmon and garnish with slices of lime and fresh dill. Goes great with any kind of potatoes, like our fluffy pommes dauphines. Just what I needed! Inspiration for Easter! Can’t get enough of salmon either :) Love it!